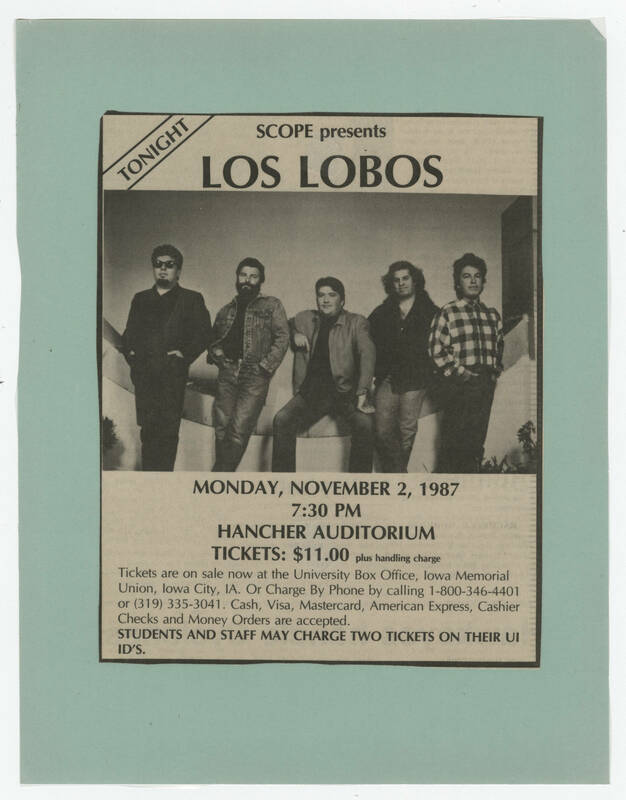 TONIGHT SCOPE presents LOS LOBOS [[Image]] MONDAY, NOVEMBER 2, 1987 7:30 PM HANCHER AUDITORIUM TICKETS: $11.00 plus handling charge Tickers are on sale now at the University Box Office, Iowa Memorial Union, Iowa City, IA. Or Charge by Phone by calling 1-800-346-4401 or (319) 335-3041. Cash, Visa, Mastercard, American Express, Cashier Checks and Money Orders are accepted. STUDENTS AND STAFF MAY CHARGE TWO TICKETS ON THEIR UI ID'S.